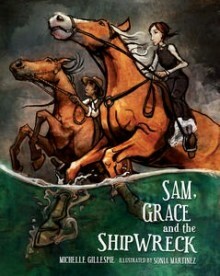 Sam, Grace and the Shipwreck by Michelle Gillespie and illustrated Sonia Martinez. Published by Fremantle Press, ISBN 9781921696008. A ship—the Georgette—runs aground in Calgardup Bay WA in December 1876. This is the true story of a shipwreck and the daring rescue of the survivors by stockman Sam Isaacs and sixteen-year-old Grace Bussell, both on horseback. The illustrations show the drama as it unfolds and have the feel of long-ago adventure—with sepia coloured backgrounds framing lots of the artwork. We also love books with interesting endpapers, and the endpapers in this book are paintings showing scenes before and after the events in the story. At the end of the book you’ll find a summary of the events of that day and a brief biography of the author and illustrator (apparently the illustrator drew lots of horses when she was growing up, and it came in handy for illustrating this story!). Sam, Grace and the Shipwreck has adventure, bravery, history … and horses. You’ll love it!